As President Petro Poroshenko signed the lustration law, the trash dumping of lawmakers in Ukraine is gaining momentum. The General Prosecutor warned that there is a thin line between the so-called ‘trash lustration’ and lynching. Poroshenko signed the law that establishes the legal framework for checking government officials linked to the rule of ousted President Yanukovich. The law is aimed at restoring “trust in the authorities and creating conditions for building a new system of power bodies in line with European standards," his press-service said. 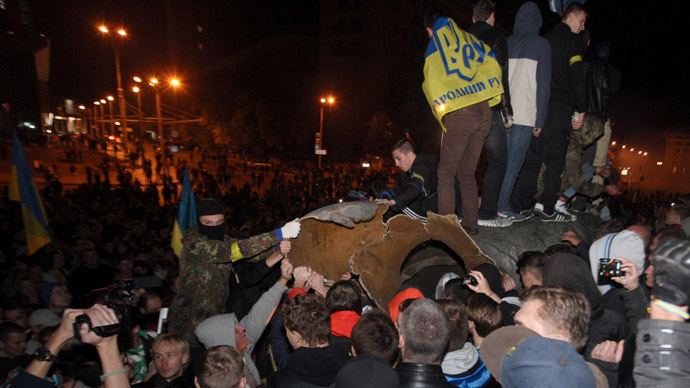 Meanwhile, mob rule has gained wide popularity among Ukrainian radicals, who attack officials on the streets, beat them and throw them into rubbish cans. The violence has sprung up due to the passiveness of law enforcement, while the increase of such incidents can lead to serious consequences, wrote Ukraine’s General Prosecutor Vitaly Yaryoma in an article published by LB.UA on Thursday. Over a dozen of politicians and MPs have fallen victim to the mob rule of trash dumping since the parliament passed the lustration bill in September. 1. In early September Right Sector members dumped Oleg Rudenko, the head of the fund of social insurance in Odessa. They accused him of demanding a bribe estimated at 558,000 hryvnia ($43,000) for sending children to health camps. 2. On September 26, the deputy head of Rovno’s regional council Aleksandr Danilchuk was thrown into a rubbish can for cooperating with Yanukovich’s Party of Regions, according to local media. Danilchuk was attacked in the council building before it adjourned. After that he attempted to return to the council’s meeting but was prevented from doing so. 3. In another case on September 19 an anti-Maidan politician, MP of Kirovograd regional council was attacked by radicals. 4. Right Sector activists also trashed the head of the head of the Ternopol regional administration on September 18 after forcing him to resign. The radicals accused him of actively supporting the ex-ruling Party of Regions. 5. Supporters of the Radical Party headed by Oleg Lyashko, notorious for his abductions and torture of regional officials, attacked an MP of the Kirovograd regional council Vasily Smagluk in Late September. 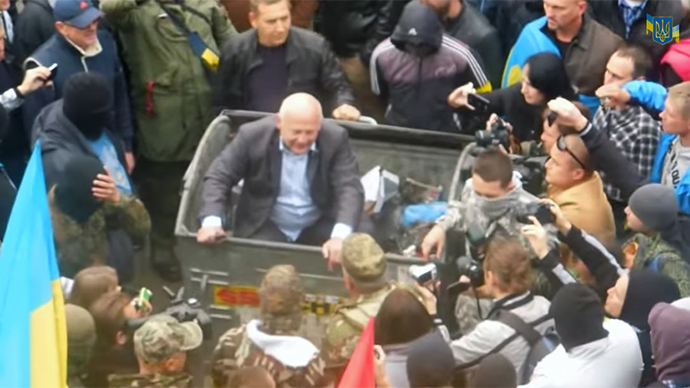 Smagluk was thrown in a rubbish can for refusing to organize a meeting with the newly appointed head of the council. 6. Lyashko’s supporters also dumped Aleksey Gavrilyuk, head of the electoral commission in the town of Irpen, in Kiev Region in September. He was forced to resign, accused of collaborating with the Party of Regions and falsifying election results during the previous presidential election to help Yanukovich win. 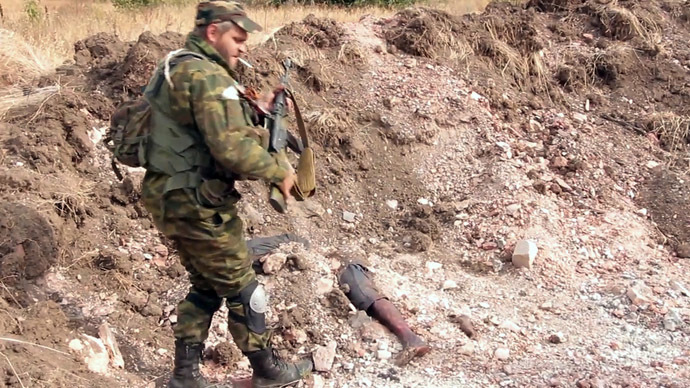 7.Right Sector radicals threw in the trash the former ataman (commander) of the Zaporozhye army Aleksandr Panchenko for “anti-Ukrainian behavior and separatist attitudes,” local media reported in September. 8. The MP of the Cherkassy regional council Aleksandr Kharlamov was attacked in the council’s building and a bucket was put over his head in September. 9. The former deputy head of the Cherkassy regional council Valdimir Vovchenko was “binned” the same month. 10. The self-proclaimed lustrators also “tried” a head of the Chernovtsy municipal hospital for war veterans in October. Doctor Manolya Migaychuk was accused of not fulfilling his responsibilities and forced to resign, according to local media. 11. Right Sector radicals trashed the head of the emergencies service in Nikolaev and member of the Party of Regions Petr Kaminsky. The radicals met him after his court hearing on October 6, where he was tried for drink-driving. The court ruled that he was not guilty. The second attack occurred on September 26. 13. The same thing happened to MP Viktor Pilipishin, who was seized by radicals and pushed into a garbage bin in Kiev after arriving to submit his documents to the Central Election Commission for the upcoming parliamentary elections on October 26. 14. 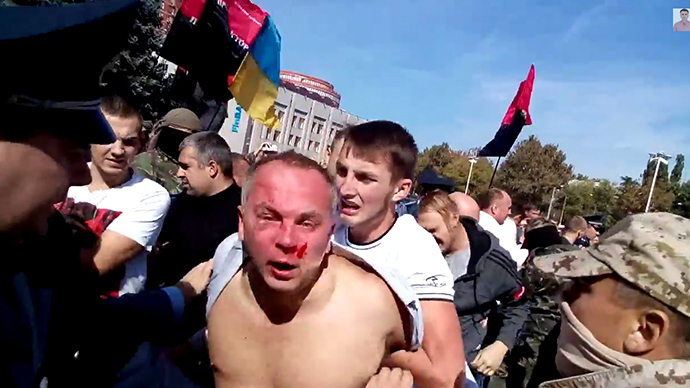 Also in October, Nestor Shufrych – a Ukrainian parliamentarian and former minister of emergencies - was attacked and beaten by a group of radicals in the port city of Odessa. He was diagnosed with concussion and closed craniocerebral injury.